Extract the belly from the pig. Wash it in cold water. Pat dry. Score the top in a diagonal pattern to allow the marinade to penetrate the meat. Heat the oil. Brown the pork belly on each side. Pour the oil and the fat rendered into the pot for the marinade. Prepare a marinade: mix the ingredients above. Add the pork belly. Add enough water to completely cover the belly. Leave for 7-8 days, stirring occasionally. Once it has absorbed the marinade, remove it, drain off the liquid and let it air dry. 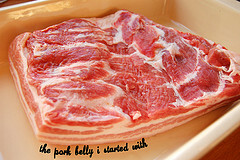 For the final preparation: cut the belly pork into pieces or slices and place them in a container for storage. Heat the olive oil and fry the garlic cloves. When done pour them and the olive oil over the belly pork. 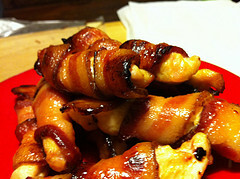 The pieces of belly pork can be added to other food preparations, fried or simply heated. Traditionally, pieces or slices are served with wine and bread as a tapa. *Today paprika is used instead of wine and pepper especially that from Vera which is very famous. I usually use pimentón de la Vera, origan, garlic and olive oil to marinate pork (even ribs or meat cut in cubes for "pinchos"). Rosmarin and thym work also very well. A Polish friend of mine makes a roast with this piece of pork cut lengthwise into halves; he trimms the skin diagonallly as you say, and put it in the oven with marjoran, garlic and olive oil, very slowly. It can be eaten hot and I dare say even better cold. My variation includes rosmarin, garlic and clover, good also with ribs. Next time I'll try with wine. MMMMMM...!! !